Hi im running my new cpu "I5 3570k" at 4,5ghz.. my max temperature is 70° on prime 95 full stress test. My question is.. do u think 70° is ok for that cpu? Those temps are great for prime95. The 3570Ks don't throttle until 105C so you are well within the limits of your cooler. Under 85C on prime95 is generally the recommended value. Dolphin should run cooler than 70C, so normal use will be much cooler than that. Quote: My question is.. do u think 70° is ok for that cpu? 1. Which specific AMD cpu? AMD is a company, not a cpu. 2. What do you mean by "burn"? Pretty much all AMD cpus made in the last 6 years can function at and above 75C. Quote: The 3570Ks don't shut down until 105C so you are well within the limits of your cooler. Fixed that for you. They throttle well before that. Quote: Under 85C on prime95 is generally the recommended value. That depends on his voltage. Quote: Wait, ivy bridge CPU's can withstand those kind of temps... I learn something new everyday. They've been able to withstand crazy high temperatures ever since nehalem. Where have you been for the last 3 years? 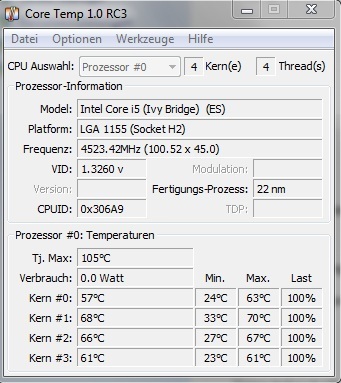 My laptops sandy bridge hits 100C regularly without shutting down; it starts to throttle there. Sandy bridge shuts down the computer entirely at 125C. Ivy Bridge is higher than that. Thats what i actually got.. a sabertooth z77 and an intel i5 3570k. You should get the i5 too. Quote: That depends on his voltage. Unless his voltage is ridiculously low that he can't OC that high and maintain stability than it is probably fine. If he over-bolted I wild expect the temps to go higher than 85C. Voltage depends on the CPU, and I can't speak for how good your voltages are because each and every CPU is different. I would think that is high, but I can't work magic and OC your CPU for you, so idk. Quote: My laptops sandy bridge hits 100C regularly without shutting down; it starts to throttle there. Sandy bridge shuts down the computer entirely at 125C. Ivy Bridge is higher than that. Are you sure about that? Historically Intel has usually set the throttle point to around 10 degrees below the thermal threshold. And I know the dielectric layer of transistors starts to break down (by which I mean stop working normally) at around 130 C if I recall. Edit: Yep. You're right. They don't throttle until they hit the Tjunction max, that's crazy. Quote: Unless his voltage is ridiculously low that he can't OC that high and maintain stability than it is probably fine. If he over-bolted I wild expect the temps to go higher than 85C. What I meant is that the higher your voltage is the lower your temperatures need to be. Temperatures that may be safe at 1.2v may not necessarily be safe at 1.3v. The same thing goes for clock rate, but to a lesser degree. That voltage is slightly higher than what I would expect for that clock rate. But then again you have enough cooling to handle it.